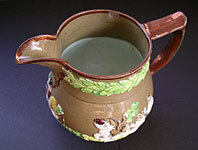 "This super drabware jug enhanced with applied relief moulded figure decoration is a classic example of English pottery. 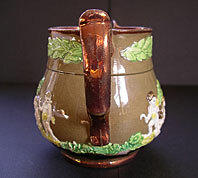 It is delightfully painted in prattware covers and subtly enhanced with copper lustre to base, rim and handle. 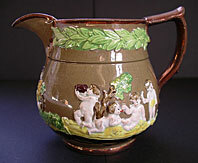 Very unusual to find a jug of this type marked by the maker. 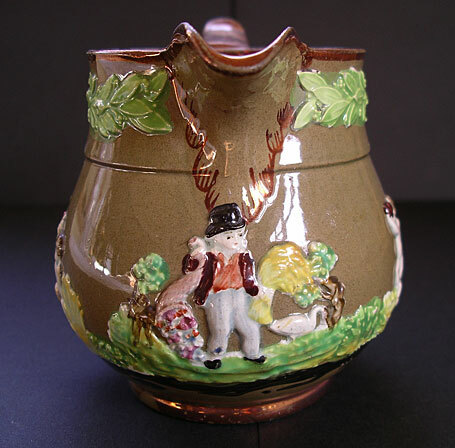 It was made by the respected Staffordshire pottery firm of Enoch Wood and Sons and dates circa 1820. Enjoy!" Antiques Expert Hamilton Bear. 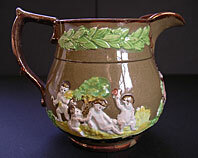 References: Another near identical marked example is illustrated in A Collector's Guide to English Pottery, Griselda Lewis page 155 bottom right. Dimensions: height 100 mm max. width 122 mm max. Marks: Makers name Enoch Wood and Sons impressed as illustrated. 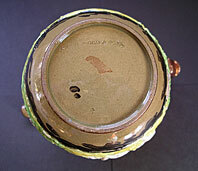 Condition: Excellent condition for English pottery. There is one flat flake chip to the inside of the rim (illustrated). This blends in well with the overall colouring of the piece and does nor spoil the decorative qualities for display. A great display and study reference piece.